“We sailed away from there with heavy hearts and reached the country of the Cyclopes…” From the Odyssey. 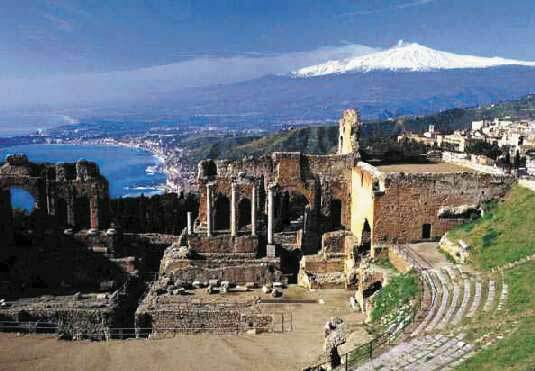 As the plane banked around Mount Aetna and began to descend toward Catania I wondered whether my odyssey would have any semblance to Homer’s tale of another failed sailor long blown off course. My pride in being chosen as the ‘plank officer,’ the first American author to tour our Navy bases in the Mediterranean, has obscured my private concern that work on A Novel Approach, on book reviews and award nominations, on The Letter Project and articles for publication, all are obscuring how much trouble I am having in working on Children of a Good War. It took me forty years to write Virginia’s War and Engaged in War and I found myself, again, off course. Now, at the invitation of the Navy and by nomination of the MWSA, Alice and I have followed in others’ footsteps to Sicily, the island that Homer referred to as the home of the Cylops, “a crude and lawless people.” As it happens, with Sicily as the starting point of my journey, it and my new friends from NAS Sigonella have done a great deal to help me get back on course. It started with a look at the old. My host Bob Froelicher and his wife Rita took Alice and me to Taormina and the elegant Greek amphitheater that overlooks the bay where Odysseus landed. That is the amphitheater in the photograph. By eight that evening, Bob and I were gathering rocks from the Isolo Cyclopo for my friend Keith. Next day, Bob and Richard Aubrey, base librarian at Sigonella, put me to work. The Sigonella DOD school invited me to spend an hour with the fifth-sixth graders in the morning and another with junior high students in the afternoon. The last thing I want to talk about with school kids is my novels. (I don’t even like to talk about me, the writer of great novels). It couldn’t have gone better. We talked about what is the most important story (more on this, later) and about how much of the time the first Apollo moon landing was on course to the moon (about 10%). The question, now and in the time of Odysseus, is not where you are but where you want to end up. (“No one gets to go back and have a new beginning; everyone gets to start from here and make a new ending.”) The students are smart, computer literate, and heavy readers. DOD schools are modern, the teachers devoted, and the students have no class wars, not race, not wealth, not health — they are all equal. It shows. When I was not pack-muling in the schools Richard took me to the satellite base where flight operations take place. I cannot say enough about the Navy men and women I met, both there and back on the main base. Young, fit, dedicated, and uniformly happy to be in the Navy, they are who I envision when I close my eyes and think of citizen’s blessings. We did a book event at the satellite base and another in the evening at the main base. As these unfolded, and as I chatted with the students about The Red Car, (the book that made me believe I wanted to be a sports car driver so that I could get out of Groom and have adventures), the more I realized that it was I, not they, who needed to know about course corrections. There are a lot of men and women, both Navy and DOD, who have their own stories to tell. The big draw wasn’t ‘Jack London – Famous Guy.’ It was ‘Jack, let me tell you…’their stories. I heard, and learned, far more from them than they from me, and I am so much better off for it. By the end of the day I was whipped. Richard and his wife Maria, and Mary Russo, took us off base to Medusa for Sicilian sea food. All I can say is — it takes mussels. Oh, how I love mussels. So Sicily wrapped up, with a platter of mollusks, and the next morning it was up and off to Naples. ← My Goodness: Number One! Thank you very, very much.